Young Irelanders received the Irish tricolour from French republicans while in Paris in 1848. Irish nationalism ; Repeal with Act of Union while under British Empire. Young Ireland (Irish: Éire Óg, IPA: [ˈeːɾʲə ˈoːɡ]) was a political, cultural and social movement of the mid-19th century. It began as a tendency within Daniel O'Connell's Repeal Association, associated with The Nation newspaper, but eventually split to found the Irish Confederation in 1847. Young Ireland led changes in Irish nationalism, including an abortive rebellion known as the Young Irelander Rebellion of 1848. Many of the rebellion's leaders were tried for sedition and sentenced to penal transportation to Van Diemen's Land. From its beginnings in the late 1830s, Young Ireland grew in influence and inspired following generations of Irish nationalists. Some of the junior members of the movement went on to found the Irish Republican Brotherhood. The name Young Ireland was originally used in a disparaging way to describe the group of young Repeal Association members who were associated with The Nation newspaper. At the time, the Repeal Association was campaigning for the repeal of the Act of Union 1800 between the kingdoms of Great Britain and Ireland. The term was first coined by the "English" press, and later used by leader Daniel O'Connell in a vindictive attack at Conciliation Hall, home of the Repeal Association. Young Ireland traced its origins to the new College Historical Society, founded on 29 March 1839, at a meeting at Francis Kearney's chambers, 27 College. Among the members of this new society were John Blake Dillon, Thomas MacNevin, William Eliot Hudson and Thomas Davis, who was elected its president in 1840. While still at Trinity College, Davis had addressed the Dublin Historical Society, which met at the Dorset Institute in Upper Sackville Street from 1836 to 1838. Davis became president and gave two lectures. (Available from the National Library of Ireland, the lectures clearly show that Davis had become a convinced Irish nationalist by this period. On 15 April 1840, Daniel O’Connell held the first meeting of his new Repeal Association, in the Corn Exchange, Dublin. The group was received with sneers, and O’Connell's sincerity was questioned. In the General Election in 1832, O’Connell had made the same appeal for repeal. Although half the representatives chosen for Ireland were pledged Repealers, O’Connell dropped the demand. Several new members accepted appointments under the system they had pledged to overthrow. Since that time, O’Connell had become a close ally of the Whigs. As they were expected to fall from power in 1840, activists' renewing the agitation for Repeal was suspected as a device to embarrass the new administration. Not one man of status, outside the members of the defunct Association, joined the ranks of the new one. With the new Association's mounting debts, the contributions from its members not sufficient to pay half its ordinary expenses, both Thomas Davis and John Blake Dillon, joined its ranks in April 1841, having in the process, to overcome their dislike of the abusive tone of O’Connell's agitation. O’Connell welcomed them and made them members of the General Committee, which controlled the organisation of the Association. The two men began their work in earnest; Davis first became Chairman of a sub-committee in charge of the registers of the Association, which contained the names of all the Members. Davis thus could communicate with all the leading politicians of the Party, and whenever he came across any with depth or ability; he at once developed into friendly associations. In the autumn of 1841, Dillon and Davis took over the roles of Editor and sub-Editor of the Morning Register, a Dublin daily paper belonging to Alderman Staunton, which had been the organ of the Catholic Association, and “was generally regarded among the mercenaries” of the Dublin Castle, according to Michael Doheny, who was to become one of Young Ireland's leading figures. As editors they featured articles on such topics as Protestant nationality, historical parallels from classic and mediaeval history, and agencies and conditions of guerrilla warfare. Michael Doheny suggests in his Felon’s Track that “all Dublin was startled by the originality, vigour and brilliancy of its articles”. It was also at this time that they first came into contact with Charles Gavan Duffy. On Duffy's next visit to Dublin some six months later, he discovered that Davis and Dillon had abandoned their experiment with the Register. Davis had no way to reach a wider public, even with his contributions to the Dublin Monthly Magazine. The three decided to found a new national newspaper, which they called The Nation. Into this new venture, Dillon brought two young friends, the barrister John O'Hagan and law student John Edward Pigot. Davis brought some of his circle of young friends from the Historical Society, and Duffy brought in the poet James Clarence Mangan; William O’Neill Daunt, a County Cork landowner; and T. M. Hughes, former editor of the London Charivari, which was later absorbed into Punch. On 15 October 1842, the first number of The Nation was launched. “The appearance of The Nation and its immediate and phenomenal success was a reinforcement for which O’Connell had scarcely dared to hope”. For the next three years, the newspaper was a major influence in nationalist thinking. O’Connell was aware of the significance of the support of the young men, but was wary of their professed freedom from the “gratitude of the past.” Davis was a skilful propagandist who worked behind the scenes, but exerted a singular influence. The success of the newspaper soon produced significant results. One of the most distinctive developments was the organisation of Repeal reading rooms all over the country which The Nation was soon addressed. They found this an effective method of spreading their propaganda. By the spring of 1843, when The Nation had been in existence for six months, agitation for Repeal was becoming formidable, and the Government was beginning to consider the old problem of how to suppress it. When members of the association, the Young Irelanders did not advocate use of physical force to advance the cause of repeal and opposed any such policy, O'Connell's introduction of the “Peace Resolutions” in the Repeal Association was in part an attempt to suggest the Young Irelanders were forces for violence. The "Peace Resolutions" stated that physical force could never be justified under any circumstances, at any time, and this was to be applied retrospectively. The use of physical force only became an issue with the Young Irelanders, after they had left the association, and had formed the Irish Confederation. O'Connell had used the threat of force, as was seen in his campaign for Catholic Emancipation, but afterward he did not have the will. This was demonstrated by the cancelled 'monster meeting' planned for Clontarf in 1843. The monster Meetings were long a design of Thomas Davis, John Blake Dillon and Michael Doheny. The object of which was to train the people to military movements, since this object would obviously be unsafe to announce, it was to be effected by other means. Daniel O’Connell was fully aware of their intent at the time, though he later denied it and repudiated those involved. This meeting was prohibited by the British government, backed up with the threat of military force. O'Connell took a political decision to not press ahead with the summoning of the planned meeting for Clontarf, as the government had plans ready to suppress it. This diminished his credibility with the British – they were only prepared to concede when they believed that there was a serious risk of an uprising. The Young Irelanders had always agreed with Daniel O'Connell and the Repeal Association in its demand for repeal, but split, when it did come, was over O'Connell's attempts to form an alliance with the Whig Party in England, which would have led to the dropping of repeal, as had happened in 1835. While the pretence used by O’Connell's supporters, was the adoption of the Peace Resolutions. Late in the autumn of 1846, some prominent men undertook the task of remonstrating with the Repeal Association. Among them were Mr. Keeley, Mr. Holywood, Mr. Crean and Mr. Halpin, all prominent Dublin citizens. A few weeks later, a remonstrance at the course pursued by the Association was produced and was signed by fifteen hundred leading citizens of Dublin. It was delivered to the Chairman of the Repeal Association on 2 October. This remonstrance was ordered by John O’Connell (Daniel O’Connell's son), to be flung into the gutter. The Remonstrants and the public resented this humiliation, and determined to hold a meeting in the Rotunda, Dublin, where they proposed to defend themselves against this indignity. The meeting was held on 3 November. Mr. Thomas D'Arcy McGee, who had never been a Member of the Association attended, and his speech described by Michael Doheny to be "calm, forcible and conclusive on the points at issue; and the excitement it created was, in no small degree, enhanced by the fact that the speaker was a young man theretofore unknown". The success of the meeting suggested the possibility of an experiment upon a large scale, as a preliminary to the formation of the Confederation. The meeting was set for the 2 December. The main object was to reply to the calumnies which, for nearly six months, had been urged against the leading seceders. The remonstrant committee offered to defend them against any allegations put by the Repeal Association. The meeting was one of the most important ever held in the city. The entire ability of the seceders was put into its preparation. Michael Doheny states that "such was the sensation created by the proceedings that two publishers, one in Dublin and one in Belfast, brought out reports, in pamphlet form, which were read all over the country with the greatest avidity". It was suggested, casually at the meeting, that the seceders would meet in January to announce the course of political action they would recommend. On 13 January, the seceders met again, and their deliberations were supported again by the same men, to secure to the seceders freedom of speech and of action. It was at this meeting the Irish Confederation was fully established. The foundations of which were to be freedom, tolerance and truth. There were no declarations or calls for rebellion, and no pledges of peace were given. The objectives were they outlined the independence of the Irish nation and no means to attain that end were abjured, save such as were inconsistent with honour, morality and reason. The Young Irelanders were inspired by the French Revolution, and popular uprisings in 1848 across Europe in which governments and monarchies toppled in favour of democratic reforms. 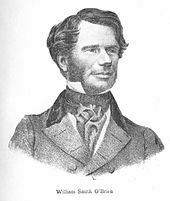 William Smith O'Brien, the leader of the Young Ireland Party, launched an attempted rebellion in July 1848, in response to the introduction of martial law. He gathered landlords and tenants together with Young Irelanders. O'Brien's failure to capture a party of police barricaded in widow McCormack's house, who were holding her children as hostages, marked the effective end of the revolt. Though intermittent resistance continued till late 1849, O'Brien and his colleagues were quickly arrested and convicted of sedition. Originally sentenced to death, the young men received a great outpouring of public support. The government commuted their sentences to penal transportation to Van Diemen's Land, where they joined John Mitchel. The "Irish gentlemen" were assigned to different settlements to try to reduce their continued collaboration. James Quinn. Young Ireland and The Writing of Irish History (2015). Richard Davis The Young Ireland Movement (Dublin, 1987). Malcolm Brown, The Politics of Irish Literature: from Thomas Davis to W.B. Yeats, Allen & Unwin, 1973. Aidan Hegarty,	John Mitchel, A Cause Too Many, Camlane Press. Arthur Griffith, Thomas Davis, The Thinker and Teacher, M.H. Gill & Son, 1922. Young Ireland and 1848,	Dennis Gwynn,	Cork University Press, 1949. Daniel O'Connell The Irish Liberator,	Dennis Gwynn,	Hutchinson & Co, Ltd.
O'Connell Davis and the Colleges Bill,	Dennis Gwynn,	Cork University Press, 1948. Meagher of The Sword,	Edited By Arthur Griffith,	M. H. Gill & Son, Ltd., 1916. Young Irelander Abroad: The Diary of Charles Hart, Ed. Brendan O'Cathaoir, University Press. John Mitchel: First Felon for Ireland, Ed. Brian O'Higgins, Brian O'Higgins 1947. Rossa's Recollections: 1838 to 1898, The Lyons Press, 2004. James Connolly, The Re-Conquest of Ireland, Fleet Street, 1915. Louis J. Walsh, John Mitchel: Noted Irish Lives, The Talbot Press Ltd, 1934. Life of John Mitchel,	P. A. Sillard,	James Duffy and Co., Ltd 1908. Seamus MacCall, Irish Mitchel, Thomas Nelson and Sons Ltd, 1938. T. A. Jackson, Ireland Her Own, Lawrence & Wishart, Ltd, 1976. T. C. Luby, Life and Times of Daniel O'Connell, Cameron & Ferguson. T. F. O'Sullivan, Young Ireland, The Kerryman Ltd., 1945. Terry Golway, Irish Rebel John Devoy and America's Fight for Irish Freedom, St. Martin's Griffin, 1998. Thomas Gallagher, Paddy's Lament: Ireland 1846–1847 Prelude to Hatred, Poolbeg, 1994. James Fintan Lalor, Thomas, P. O'Neill, Golden Publications, 2003. Charles Gavan Duffy: Conversations With Carlyle (1892), with Introduction, Stray Thoughts On Young Ireland, by Brendan Clifford, Athol Books, Belfast, ISBN 0-85034-114-0. Wikimedia Commons has media related to Young Ireland. Wikisource has the text of the 1905 New International Encyclopedia article Young Ireland. Legal transcripts relating to the trials of Young Irelanders. This page was last edited on 14 February 2019, at 03:26 (UTC).